PART II : SETTING THE SCENE Subtitle : Data, time series and models : what we think we know about variability in the Benguela and comparable systems. This is a book which examines much of what we know and also what we don’t know about the Benguela Current Large Marine Ecosystem and its inherent variability. 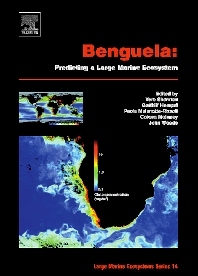 Building on recent work and exciting findings about the predictability of the Benguela and other coastal upwelling ecosystems, the book takes a look towards the future and highlights the difficulty of making predictions in such a complex and variable region. The book illustrates what scientists and managers from developed and developing countries can achieve by working together, and it lays a solid base upon which to build wise management and ensure sustainable use of the ecosystem. Oceanographers, marine biologists, ocean/fishery managers, terrestrial scientists and those interested in climate variability and change. Gotthilf Hempel is Science Advisor, Senate of Bremen, Germany, Professor Emeritus Bremen and Kiel Universities, Executive Council of the Intergovernmental Oceanographic Commission, served as Director Alfred-Wegner Institute for Polar and Marine Research, Bremerhaven; Director Institute for Baltic Research, Rostock; Director Tropical Marine Ecology Center, Bremen University; and President, International Council for the Exploration of the Sea. Massachusetts Institute of Technology, Cambridge, U.S.A.